Honestly, for this product comparison, the exterior design of Bose SoundTouch 30 is most probably favored by more people than the look of Bowers and Wilkins A7. Seriously, if you put Bowers and Wilkins A7 in the wrong place, some fellows may mistake it as a tissue box. A hefty plush tissue box, that is. Ah, but who are we to complain? Bowers and Wilkins A7 is certainly more rugged and durable than Bose SoundTouch 30. How could? Bowers and Wilkins A7 features a 6-inch Kevlar-reinforced subwoofer. You ever heard about Kevlar, right? The material is five times stronger than steel, yet more flexible and elastic. As for performance, Bose SoundTouch 30 is armed with a large woofer to deliver strong low notes, while the other two drivers at the top-front side are generating mid and high frequencies. It is strong enough to fulfil even the widest room in your house with some terrific sonic. Bose SoundTouch 30 is one of the most powerful one-piece products from Bose so far. But, how about Bowers and Wilkins A7? Well, we have mentioned the 6-inch Kevlar-reinforced subwoofer before. Besides enhancing the durability, the material also boosts its performance a lot. Its bass is exceptionally deep and rich. Add the bank of four specially designed stereo drivers into play. Each of the subwoofer and the drivers has their own dedicated Class-D amplifier. As the result, Bowers and Wilkins A7 sounds exceptionally impressive. 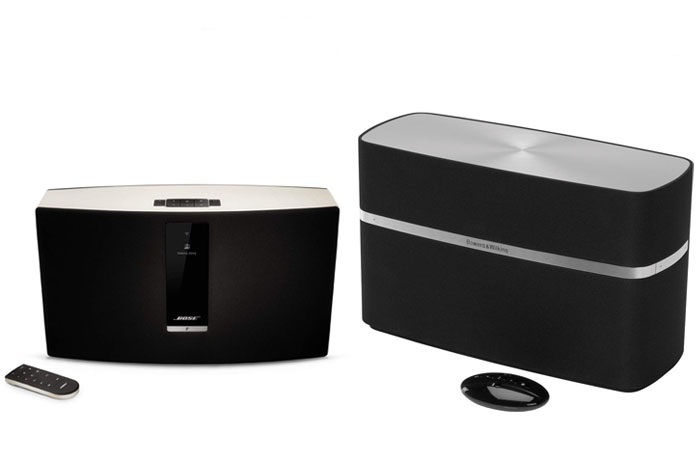 The flow of usage on Bowers and Wilkins A7 is a little different compared to Bose SoundTouch 30, but their functionalities are more-or-less similar. If you don’t mind the design, Bowers and Wilkins A7 is indeed a perfect deal for the bucks. Otherwise, if you want something less bulky, Bose SoundTouch 30 is a viable choice.